Nicole Kidman and Keith Urban were reunited on Sunday to attend the actress’ parents 50th wedding anniversary. The couple was photographed leaving the Gunner Barracks Tea Room in Mosman, New South Wales Australia with their girls following an afternoon party that included close friends and family. Keith had been in Los Angeles filming the new season of American Idol, but managed to make it in time for the big event. Not only did he attend, he reportedly serenaded his in-laws with a couple songs! Nicole was gorgeous in a Dolce&Gabbana floral printed dress. 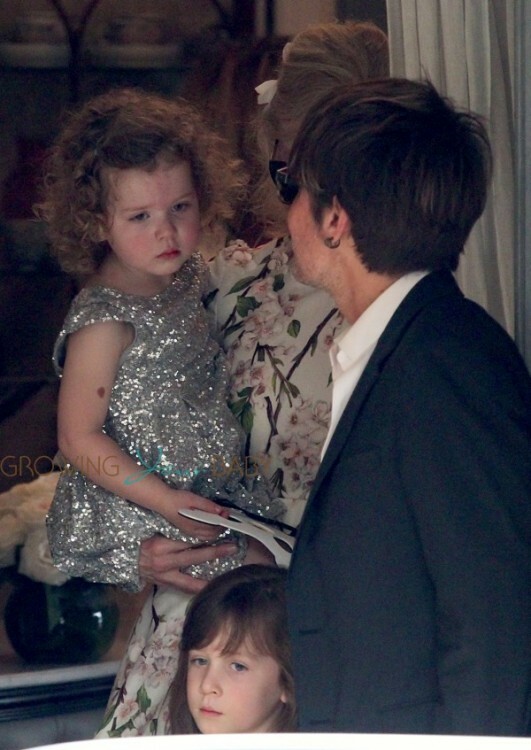 She carried her youngest daughter Faith, who wore a silver sparkly dress. We only got a peek of Sunday as she exited the party but we can only guess that she looked as cute as her sister! The family will likely enjoy the Christmas holidays with their family down under before returning to the U.S. for the debut of the 13th season of American Idol next month. The time off is well deserved for Nicole, who completed three films this year and has three in the works for 2014!